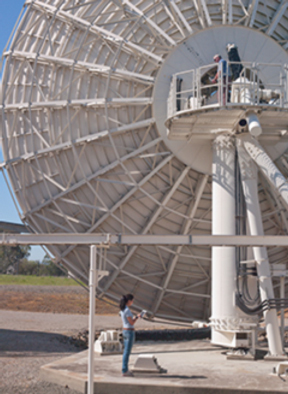 Keysight works with customers who are involved in every form of communication technology: satellite, cellular, cable, fiber, landline, microwave backhaul, and wireless connectivity. All have a need to enhance system performance, increase data throughput, maintain system uptime, lower the cost of service and reduce customer churn. In satellites, various types of systems are used for applications such as broadcast, bidirectional data, navigation, remote sensing and mobile communications. Every system has two major parts: the space segment and the ground segment. For practical reasons, our focus is on the ground segment. Effective maintenance and troubleshooting of satellite earth stations requires testing of antennas, transmission lines, transmitters and receivers as well as the overall system. 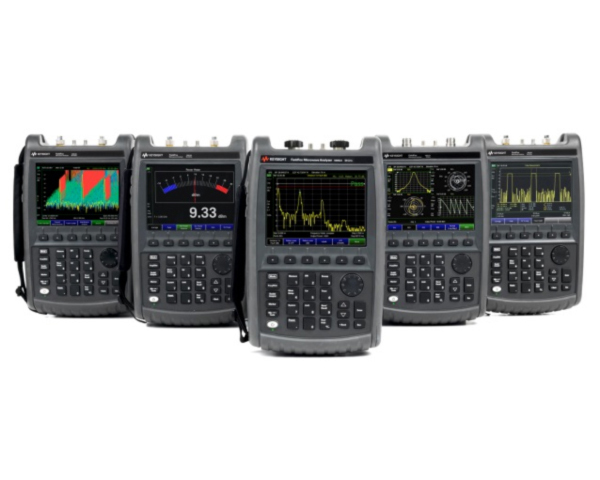 Completing those tests often requires five or six types of test equipment including a power meter, a spectrum analyzer and a vector network analyzer (VNA). A FieldFox handheld combination analyzer can be configured to provide all of the required capability in a single unit. Its combination of measurement and analysis capabilities enables faster validation of system performance and diagnosis of faults. And now, FieldFox delivers precise measurements up to 50 GHz virtually anywhere on earth satellite maintainers need to go (Figure 1). 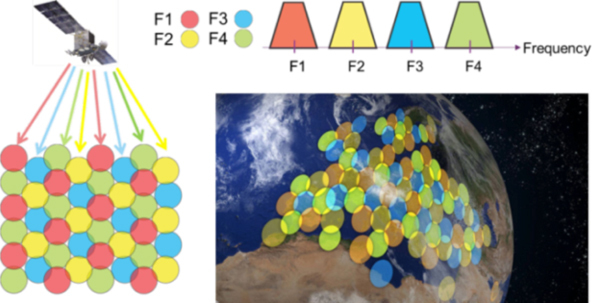 In satellites, the engineering problem is easy to summarize: pack more bits into the available spectrum, achieve faster data throughput, and do so in a power-efficient manner. Solving the problem is more complicated and is driving technological shifts such as wider bandwidths, spectrum reuse and complex modulation. Wider bandwidths enable higher peak data rates for a single user and also increase overall system capacity by expanding the number of available channels. Multiple channels are multiplexed together, creating one wider-bandwidth signal that is sent as one transmission through a single transponder. Spectrum reuse is enabled by the use of narrow spot beams. The ability to create spot beams allows more power to be focused onto high-demand areas. It also helps overcome weather attenuation, allowing use of the Ka-band. This accesses more of the unused spectrum, enabling even higher bandwidth and throughput. Using phased-array antennas, these beams can be steered to focus on specific regions and then be quickly reconfigured as needed. A single satellite can produce dozens to hundreds of spot beams and, as long as the respective beams don't overlap, the same frequency can be used for transmissions to and from physically isolated areas (Figure 2). The third trend is toward the use of increasingly complex modulation formats. These enable higher data rates through greater spectral efficiency and a better signal-to-noise ratio; however, this requires tradeoffs between capacity, power efficiency and link performance. Industry innovations such as high-throughput satellites (HTS) and digitally regenerative payloads are the embodiment of these shifts. Both use architectures that are quite different from conventional analog “bent-pipe” designs. Instead, these are mixed-signal systems that carry analog and digital representations of modulated signals. 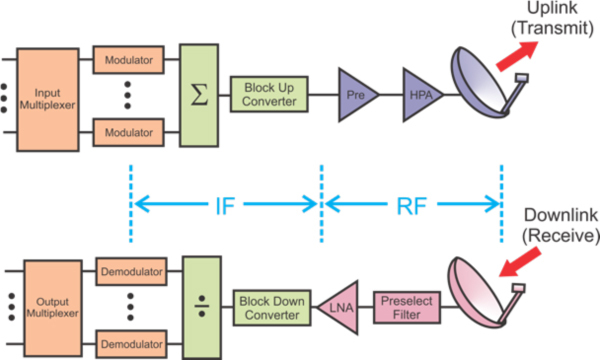 Digital modulation formats may be wideband, higher-order or custom, but all provide greater spectral efficiency. A typical ground segment has at least three sub-segments: the satellite control system; gateways and hubs; and user terminals. The control system provides tracking, telemetry and command (TT&C). Communications, including voice, video and data, are carried between the gateways, hubs and user terminals. Effective maintenance and troubleshooting of satellite earth stations requires testing of key elements—antenna, transmission lines, transmitter and receiver—as well as the overall system. The required measurements include return loss (antenna), fault location (transmission lines), high-power amplifier performance (transmitter), low-noise amplifier (LNA) performance (receiver), and carrier-to-noise measurements (system-level). Completing these tasks requires an extensive roster of equipment: power meter, spectrum analyzer, VNA, line sweeper, RF source, and DC source. Today, combination or all-in-one analyzers provide multi-instrument capability and offer the most convenient and economical solution for testing of satellite earth stations. A FieldFox combination analyzer can be configured to provide all of the required capability in a single unit. This makes it possible to validate system performance with fast, detailed analysis of uplink and downlink signals (Figure 3). Calibrated cable and antenna test (CAT) and VNA measurements help field personnel maintain cable, waveguide and antenna systems consistently and efficiently. The combination of network analysis, spectrum analysis, power measurements, and more, enables faster diagnosis and repair of faults. The FieldFox combination analyzers are specifically designed for field testing with a 3.5-hour battery life and 7.1-pound weight. The rugged, fully sealed enclosure has no fans or vents and is compliant with US MIL-PRF-28800F Class 2 requirements and type tested to meet MIL-STD-810G Method 511.5, Procedure 1 requirements (operation in explosive environments). FieldFox is also type tested to meet IEC/EN 60529 IP53 requirements for protection from dust and water, extending instrument durability in even the harshest environments. Comparable benchtop instruments are specified to operate at a set temperature and require lengthy warm-up times. In contrast, FieldFox's spectrum analyzer mode has an automatic internal alignment function that compensates for temperature changes over a range of –10 to +55° C. With this InstAlign feature, the analyzer is ready to make highly accurate spectrum measurements at turn-on and through any temperature changes over the specified range. InstAlign also enables the built-in power meter to make accurate measurements without an external power sensor. Equally important, FieldFox time- and frequency-domain measurements have been shown to correlate with benchmark data acquired using benchtop instruments in the development lab and at system installation. FieldFox achieves S-parameter results that track the world's highest performance VNA within a few hundredths of a decibel, and match the world's highest performance spectrum analyzer within tenths of a decibel. This level of correlation increases confidence in measured results and also reduces the risk of accepting bad systems, subsystems or components, or of failing good ones. The analyzers also support remote operation through an application that runs on a variety of Apple iOS devices. This is ideal for environmental conditions in which it may be advantageous to control and observe the analyzer from the shelter of a vehicle or structure. This feature also enables collaboration between personnel, one example being an engineer working at a dish and another engineer below, analyzing measurement results through an iPad or iPhone (Figure 4). For more than 20 years, satellite operators around the world have been using our 856xE/EC series portable spectrum analyzers to handle the signal analysis portion of their maintenance and troubleshooting tasks. Today, these proven performers are no longer in production and will soon move into the “extended support” phase. Fortunately, a single FieldFox combination analyzer can replace not only the 856xE/EC but also the other RF instruments traditionally used for measurements in the field. A key benefit of migrating to modern, field-ready technology is a reduction in overall capital and operating expenditures. Moreover, FieldFox requires just one calibration per year, reducing annual costs by a factor of up to three compared to the traditional array of equipment, which requires multiple calibrations per year plus calibrations of any spare instruments. The analyzer’s design has proven its mettle in the field: FieldFox has the lowest failure rate of any complex microwave or millimeter-wave instrument from Keysight. In fact, FieldFox offers the highest reliability of any complex RF, microwave and millimeter-wave instrument, and this reduces the overall test cost by at least 50% versus comparable benchtops. A standard three-year warranty also reduces the overall repair cost. FieldFox analyzers are equipped to handle routine maintenance, in-depth troubleshooting and anything in between. Better yet, they deliver precise measurements up to 50 GHz virtually anywhere satellite maintainers need to go. A FieldFox combination analyzer can be configured to provide capabilities equal to those of the five or six separate instruments that have typically been carried into the field for earth station maintenance and troubleshooting. The combination of network analysis, spectrum analysis, power measurements, and more, enables faster diagnosis and repair of faults.